I followed her carefully, all in black it was easier to merge into the shadows. The tree-lined street my perfect disguise. Occasionally the earth would shift beneath my weight, it would send a noise out into the night, but her own heavy footsteps and sharp breathing covered any sounds I would make. Creeping closer and closer I could smell her scent drifting towards me, the sweet perfume was mixed by another scent one she didn’t even realise she was exuding, fear. She should feel me near her, but I wonder if that just made her rush even more. She reached the corner and took the opportunity to glance back to the shadows. I knew she would do it and I stood silently waiting. Her eyes caught mine. The bright green of them startled her for a second and then she smiled at me. She hurried away again but I could move quicker than she could and easily caught up. She didn’t know it yet but she needed me to follow her. As she neared the underpass that headed back to her tired estate my hair began to stand on end. This was it, this was the place. The first shape stepped out of the shadow forcing her to slow. She moved to the other side of the road and continued forward when a second shape appeared. She froze. The two shapes turned towards each other and then simultaneously began to advance towards her. She took a step or two back, her mind confused. As she came back out of the underpass the two shapes emerged from directly behind her, stretching out to grasp her. I took the moment to surprise them and drop out of the tree I was on, clawing at one of the shapes as I fell. As soon as I reached the ground I hissed and stepped towards the other, but it vanished back into the darkness of the underpass and away. The other stumbled backwards moving into the recess it had appeared from. I turned my head and looked at the girl, my green eyes held strong. She came towards me and placed her hand gently on my head. “Aren’t you a clever cat to save me?” she cooed at me, and although normally I would hate it, I allowed her to. I already felt the connection with her, even though her change hadn’t yet begun. Yes, I definitely was meant to be her familiar. 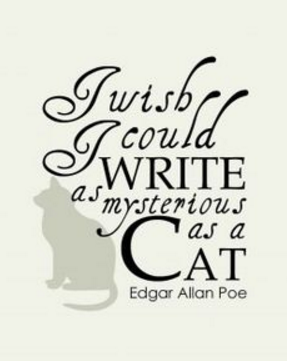 Originally written for Mystery – this week’s Writers Quote Wednesday Writing Challenge #WQWWC with this amazing Edgar Allan Poe quote, but unfortunately I didn’t quite get it finished on time. So hopefully Ronovan won’t mind the slight adjustment so I could add it to his Friday Fiction Challenge using the surprise them. This mainly follows the story of Mark Waters a homicide detective. When investigating a case he comes across a beautiful young barmaid who is suspect in a murder case. Months later the couple are together, with a baby on the way, a baby that isn’t Mark’s. Alongside Marks troubled social life he is called in to investigate a new murder in a local library. Mark’s new in-laws could be caught up in the case and with difficult decisions ahead Mark’s investigation takes some interesting turns. The story had an interesting premise and with a touch of paranormal involved I was looking forward to this read and it didn’t disappoint. It is a light-hearted cosy thriller that is easy to read and flows quite naturally. I did feel the characters could be explored/ explained a little more as there was gaps in their personalities with quite a lot of characters for the novel length but I am hoping that is because the author is creating a series and looking to grow the characters. The authors writing style is quite slow making this story ideal for lazy afternoon reads. Although there are a few action based scenes, it is mostly a book about the investigation and waiting for the clues to drop, with enough twists to keep the reader guessing. I downloaded this book straight away after reading Matty, the short story which drew me back into the Matt saga. This is a GOOD read. I loved the first of the Matt Turner stories, the second was a little bit disappointing as the story seems disjointed a little in places. However this story really flew for me and I couldn’t help wanting to know what happened next. Siemsens writing is really back on top form. The story revolves around Matt and his ability to pick an artefact and read its story. This time the plot is neat and tight and with the artefact being treasures of a long lost library what’s not to love? I love that Matt’s story has evolved in this book too, he is finding himself and getting control of his abilities instead of fearing them. I love that some old characters show up in this novel and that Siemsen has given them stronger roles in this novel. This is a fast paced story getting to the action quickly, it drops loads of amazing little details and clues along the historical storyline that make this book well believable, in a bizarre way. The settings are immense particularly Alexandria. The ending was great, I felt so thrilled for Matt and still want to know what will happen to him next, although I suspect the author was wrapping the plot up there. This series really is an odd blend, it is definitely not historical fiction and it’s not paranormal or even sci-fi, but an intriguing blend. An action filled trilogy that is an unusual read. These books would appeal to fans of Elly Griffiths, Phil Rickman, Barbara Erskine or Michael Schmicker type novels. I was lucky to get this during a free amazon promotion! As it’s only a short (really short) story make sure you don’t pay too much for it, if you do decide to buy it. That being said, this is a GOOD read. I loved the first of the Matt Turner stories, the second was a little bit disappointing as the story seems disjointed a little in places. This little story hits the nail on the head, with Siemsen’s writing back on top form. The story revolves mostly around Matt and his dad, and gives the first insight of his dads’ conflict over whether to use Matt’s abilities or not. But when it involves a missing little girl who could be in a life threatening situation he decides it’s a risk worth taking. This is a fast paced story getting to the action quickly. By going back to Matt’s childhood and home we can see his character better, the softer worried side of his mum, the tougher action based cop that is his dad and how they blend into Matt’s personality. So yes, this is a short story and not 100% the authors usual style but I like this about it, if the author had drawn it out into a longer story or worse a novel it would have just been a page filling exercise. This is real storyline, short, simple and sweet. Note – If you are going to read the Matt Turner series read this before the RETURN as it makes that stories plotline even stronger. It will be very few that pick up this book without knowing what it is about, but for those that do, this story picks up from where the shining has left off. Danny Torrence has grown up and leads a troubled adult life. His “gift” haunts him and he has turned to drink to numb it. Eventually Danny now Dan, decides he needs to start over, he changes towns, quits the drink and takes up a job in a nursing home using his shine to help others move on. But in the calm a new evil lurks in the form of a group of travellers that feed off of those with the shine. Dan meets (or rather is shined by) a young girl Abra Stone, and it is her spectacular gift, the brightest shining ever seen, that brings Dan out of his slump. Can he keep Abra safe? I think this novel is a great addition to the King collection. Danny has matured and advanced a lot of the book and although his story is now more thriller than horror in many aspects, this book manages to live up to its reputation – not an easy job. The plot is strong and interesting with a diverse cast of characters. The novel is easy to read and I think most people will get through it quickly. Overall, I found this novel an exciting read from a writer that I adore. His writing style has changed and developed over the years and this isn’t the “read-with-the-lights-on-horror” anymore. Instead, this is a well thought out book with all the character flaws and complications unfolding into a fun and diverse story.